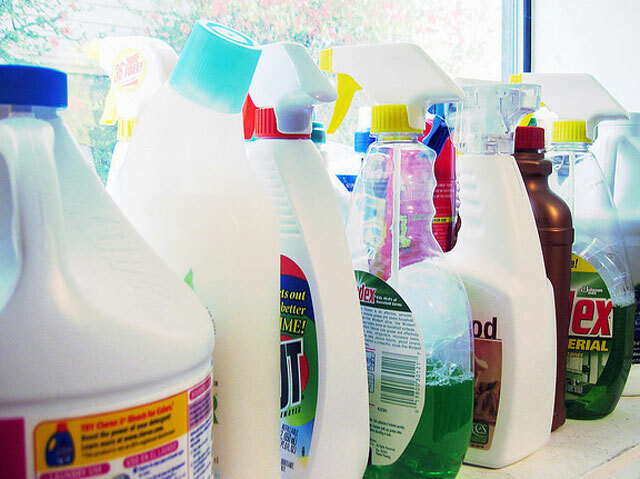 Items many of us have in our homes, such as automotive fluids, cleaners, pesticides and hobby supplies, are household hazardous waste. While these materials may be safe if used correctly, they should not be poured down your drain or onto the ground. If the words DANGER, POISON, WARNING, or CAUTION are on the label, do not throw it away. Bring it to us. Northwest Solid Waste District collects household paint and stain free of charge Monday-Friday year-round at our facility in Georgia by appointment only. Please call (802) 524-5986 to schedule an appointment. We accept other household chemicals (for a nominal fee) Monday-Friday at our Georgia facility year-round by appointment only. Please call (802) 524-5986 to schedule an appointment. We also hold Household Hazardous Waste collection events in District member towns May-September. Don’t buy a gallon jug of paint thinner when you only need a pint. The gallon will not save you money if you don’t use it. Use the least toxic material for the job. Materials labeled WARNING or CAUTION are less hazardous than those labeled DANGER or POISON. Pass left over materials on to friends and neighbors who will use them rather than store them. Always store materials in their original containers. Once a material is separated from its ingredients and usage directions, it becomes far more hazardous simply because it is unknown. Keep materials out of reach of children. This is important not only when storing the material but when using it. Never leave children unattended around a hazardous material. Store away from heat and possible sources of sparks. Store materials away from pilot lights, switches and motors.